She Writes Press, 9781631522963, 356pp. Coming of age in Prague in the 1930s, Lena Kulkova is inspired by the left-wing activists who resist the rise of fascism. She meets Otto, a refugee from Hitler's Germany, and follows him to Paris to work for the Republican side in the Spanish Civil War. As the war in Spain ends and a far greater war engulfs the continent, Lena gets stuck in Paris with no news from her Jewish family, including her beloved baby sister, left behind in Nazi-occupied Czechoslovakia. Otto, meanwhile, has fled to a village in England, and urges Lena to join him, but she can't obtain a visa. When Lena and Otto are finally reunited, the safe haven Lena has hoped for doesn't last long. Their relationship becomes strained, and Lena is torn between her loyalty to Otto and her growing attraction to Milton, the son of the eccentric Lady of the Manor. 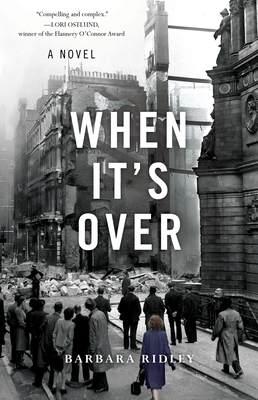 As the war continues, she yearns to be reunited with her sister, while Milton is preoccupied with the political turmoil that leads to the landslide defeat of Churchill in the 1945 election. Based on a true story, When It's Over is a moving, resonant, and timely read about the lives of war refugees, dramatic political changes, and the importance of family, love, and hope.